Join us May 14, 2016, at Wings Over Paris, featuring me, Randy, and the Texas T-Cart — as well as Kate Kyer Aerobatics and her rockin’ Pitts — and many more! Bring your family and friends to Wings Over Paris, an airshow featuring a multitude of aerobatic performances, WWII static displays, and lots of other family friendly events that all can enjoy! These confirmed performers will guarantee an exciting airshow this year! 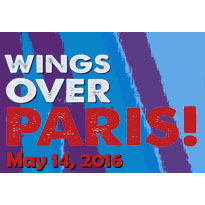 See you at “Wings Over Paris!” May 14, 2016! Keep up to date with what is happening with the show. Will air shows be performed all throughout day or just at certain times? How much would it cost to ride the airplanes and other rides.